Waldorf Music continues their James Bond naming theme with the announcement of their new software vocoder Lector. Instead of a villain, Lector refers to the name of a Russian decoding machine referenced in From Russia with Love. “Robot voices, whispering strings, talking drum loops, rhythmic pads, the resonant ringing of bells, dripping water – the possibilities are all but infinite. With a quick tweak here and there, the Lector turns any incoming signal into novel sounds and effects. Tremendously versatile, the Lector puts in your hands a sonic toolset for a wide range of diverse applications. Just about anything goes, from distorting the human voice to adding subtle harmonies to lead vocals and getting creative with movie soundtracks. Update: I found this this Sonic State videod via Synthtiopia and added it as it offers a nice demo of the Lector. In the video Nick from Sonic State asks how much and when – answer – 6 weeks, $199 EU. Lector will run on Windows or Mac. There is no buy button or pricing yet, but you can read more details here http://www.waldorfmusic.de/en/lector-overview.html. 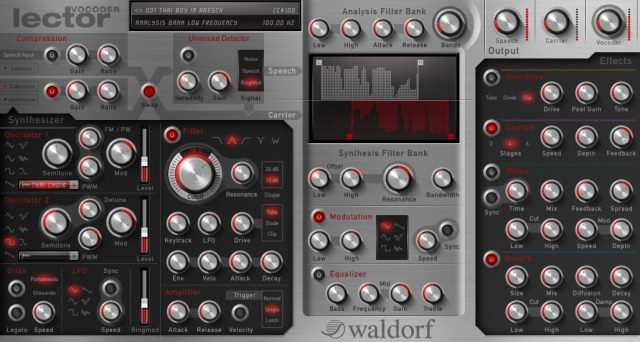 How to Make Your Waldorf Blofeld Synthesizer Go to 11!